I was double-checking some events in El Salvador's past today when I came across this forgotten piece of history: in 1823, a delegation from El Salvador came to the United States to try and persuade the US to allow El Salvador to become a state. Now wouldn't that have been interesting! 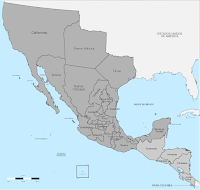 At that time, El Salvador was seeking protection from the First Mexican Empire, which then reached from northern California to Texas and down to Guatemala. El Salvador's need for protection and its interest in becoming a state apparently ended when the Mexican emperor abdicated, the empire was dissolved, and the Central American countries formed the Federal Republic of Central America which would exist until 1841. Now El Salvador seems even more a US state -- its currency is the US dollar, 1 out of every 4 Salvadorans lives in the US; Burger King, Pizza Hut, McDonald's, Wal-Mart and Starbucks have invaded El Salvador. Of course there is that big problem that the US government keeps trying to kick every Salvadoran out of the other fifty states. For a more complete version of El Salvador's attempt to become a state, see Mike Allison's blog post filling in the details. Of course, the Pipiles are descendants of an earlier Mexican empire--the Aztecs.